Hello everyone. 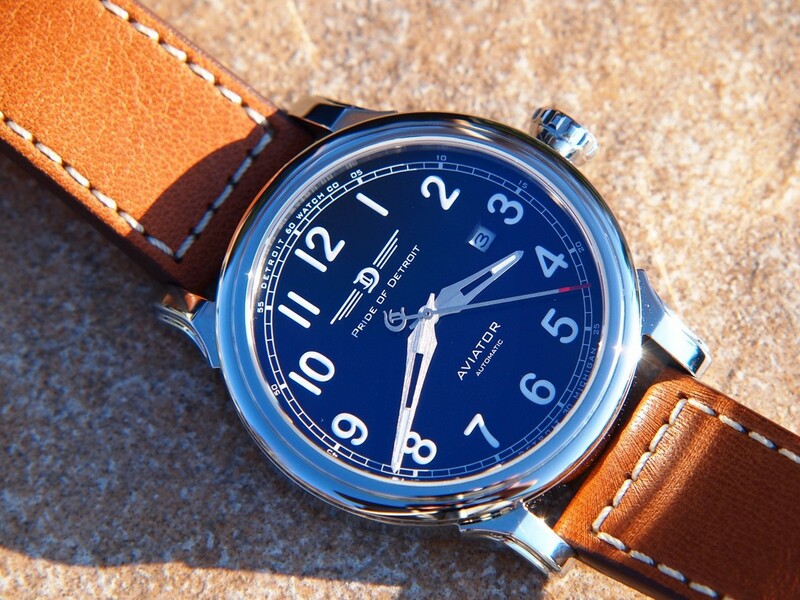 Today I am extremely pleased to present an exciting new watch brand and model, the Pride of Detroit Aviator from the Detroit Watch Company (DWC). Patrick & Amy Ayoub, the owners of the company, each have been working in the watch and design industry for the past 25-30 years with the dream of producing their own unique timepiece, resulting in the founding of the Detroit Watch Company. Of course, the goal wasn’t just to produce a watch but rather an overall watch brand unlike any other, while also paying tribute to the French heritage of the city of Detroit, Michigan. 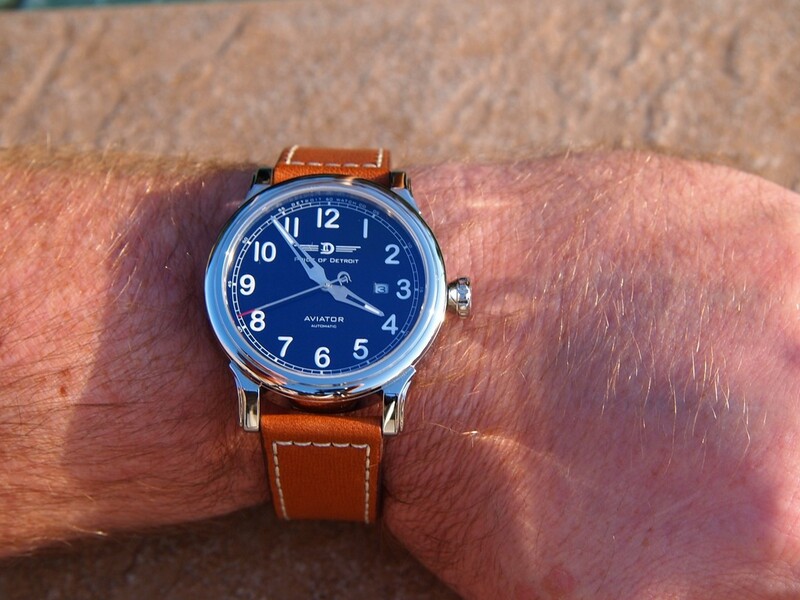 Several different watch models are now available with one being the Pride of Detroit Aviator, the subject of this review. 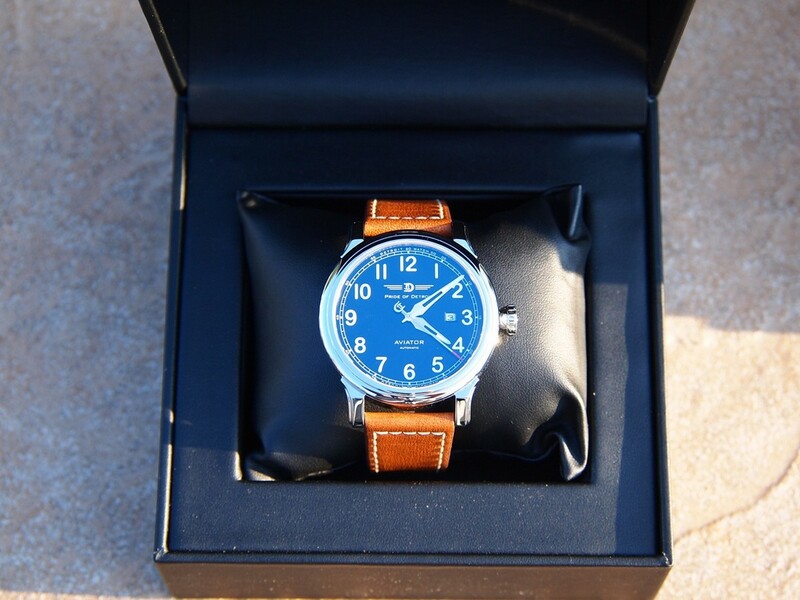 You can read more about the Detroit Watch Company (DWC) HERE. As always, I like to start off by taking a look at the packaging. The packaging is fairly standard with an outer black cardboard box and an inner clamshell style case. The quality of the packaging is extremely nice and provides adequate protection for the watch during shipping which is ultimately the most important aspect. Included with the packaging is also a nice booklet about DWC, which also contains the warranty information about the watch. All of the packaging was designed by DWC including the booklet/brochure, which is produced in-house. I will continue to suggest that companies either go extreme with their packaging or functional. I prefer functional, but extreme can, at times, be quite fun and exciting. I hope that for future productions DWC will consider looking at zipper style travel cases or rolls for those of us on the go. It is always nice to have a travel case that can carry at least two watches for short trips and a travel case. If created in the right way, it can be an excellent source of advertising. So enough about the packaging, let’s get into what ultimately matters, the watch itself. 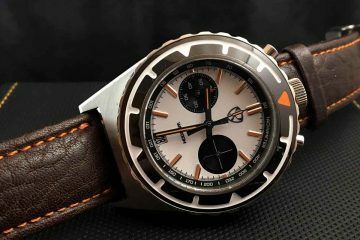 The first aspect I had to really try to get a grasp of regarding the Aviator was the price of $795 USD, as there are many other watch brands and models on the market with slightly better movements at a lower cost. The first key feature of DWC watches, including the Aviator, is that the watches are assembled right here in the United States in Detroit, Michigan. Of course, we all know that assembly costs here in the United States will drive costs upward. 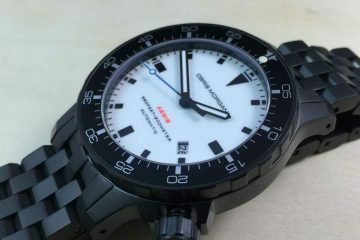 The watches are not sitting around waiting for shipping, as only a small number are ready for shipment at any given time. However, I still had some questions for the owner of DWC and verified some other truly key features about all of the watch models from DWC, including the Aviator. First, the owners of DWC, except for the movement, designed every component of the watch from top to bottom. Nothing about any of the watch models, including the Aviator, is off the shelf. The 316L high polished stainless steel case, case back and bezel were sourced from Hong Kong from a factory, that according to DWC, two Swiss brands also utilize. The watch case measures 44mm and a substantial 48mm when factoring in the diamond shaped pull/pull crown. The lug tip to lug tip measurement is a modest 52mm and the watch weighs an almost feather-like 109 grams. 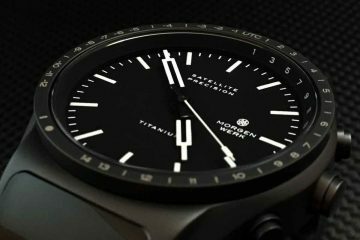 All of the specifications noted above, combined with an almost 12mm case height, will provide a substantial looking watch on the wrist. However, due to the light weight, the watch will be far from cumbersome and at times you may not even realize you have it on the wrist. I absolutely love the crown choice, as the size and shape of the crown are perfect for 44mm case. The crown measures a nearly 8mm in diameter, but when on the wrist it doesn’t dig into the wrist like so many diamond style crowns I have seen on many pilot style watches. 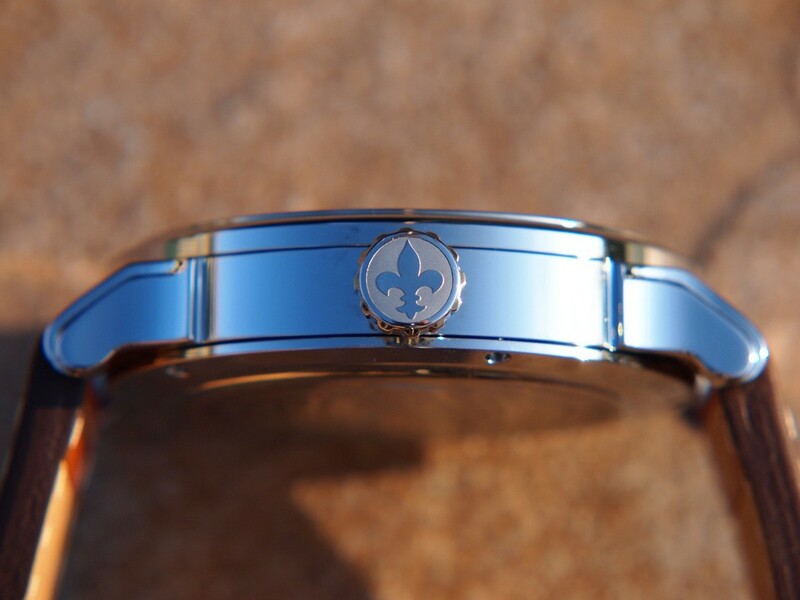 As I mentioned earlier, DWC wanted to pay tribute to the heritage of the city of Detroit for which they incorporated a fleur-de-lis logo etched into the crown face. For those of you that may not be aware, fleur-de-lis is a prominent French logo/symbol, which is still used today on their postage stamps. The crown is quite firm with no play or wiggle in either setting position. The crown winds the movement smoothly with no noticeable grinding, at least on this sample. I wish that DWC had used some sort of high-grade gasket system to help increase the water resistance from the current 5ATM. The overall case finishing is quite superb. Just be prepared to have some polishing cloths on hand to buff out surface scratches. I also really am pleased that DWC did not brand the case. So many new companies make the mistake of engraving logos or names on the non-crown side of the case. I like the looks, but MUCH too expensive for the low quality movement. $800 for a watch that doesn’t hack? No thanks.